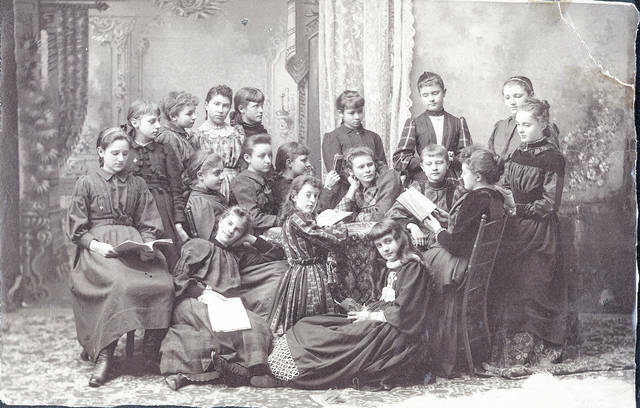 The group that called themselves the Trundle Beds was but one of many organizations of young prominent women in Lima. Standing: Hattie Ashton, Hattie Watt and Stella Moore. Seated on chairs: Laura Williams, Clara Hughes, Dora Metzger and Cora Holland. Seated on floor: Ethel Cunningham and May Kibby. This photo from 1883 shows the Nine Pins. 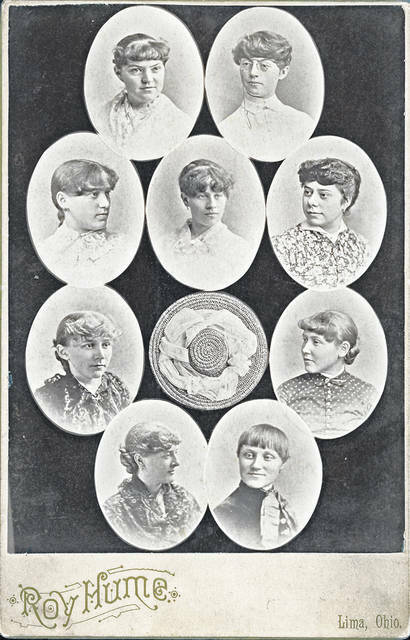 Top left, clockwise: Belle Hughe, Mary Boone, Minnie Reichelderfer, Margaret Rumple, Mabel Thrift, Libbie Dalzell, Florence Hughes, Kate Melhorn and Belle Hughes. Emma Williams is in the middle, above the hat. East School was located on North Pine Street. The True Blues was organized about 1890 by Miss Belle Hughes. Included are: Medora “Mame” Freeman, Margaret Holdridge, Florence Campbell, Belle Folsom, Belle Harrington, Winona Reichelderfer, Grace Bryan, Halce Hutchinson, Susan Humston, Belle Hughes, Blanche Neuman, Wava Roberts, Bertha Hatch, Blanche Marmon, Lenore Hughes, Martha Agerter, Olive Thomas and Gail Bates. LIMA — They were young when Lima was young, when farms and fields were but a buggy ride beyond Baxter Street and fewer than 8,000 people called the town home. They were, for the most part, the daughters of original settlers, people the newspapers unfailingly referred to as “old pioneers” when they died. Elizabeth “Libbie” Dalzell’s father was blacksmith James R. Dalzell, while Minnie Reichelderfer was the daughter of a lumber merchant. Martha Washington Agerter’s father was one of the founders of the Lima Machine Works, which became the Lima Locomotive Works. 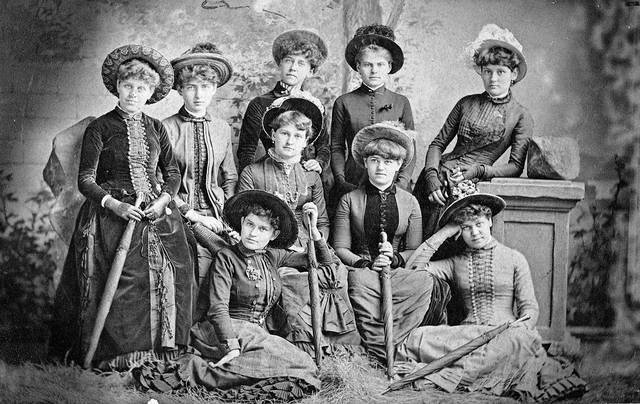 The girls attended Lima High School in the 1880s and 1890s at what was called the West School, which was bounded by McDonel and Pierce streets on the east and west and High and North streets on the south and north. 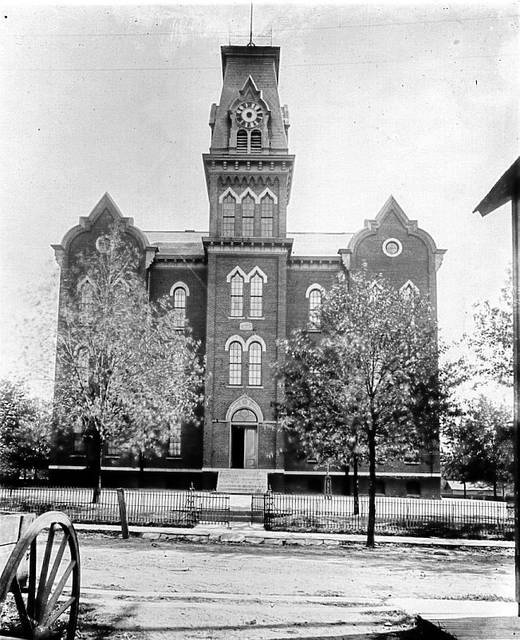 An East building was opened in 1871 on North Pine Street. They all lived within a stone’s throw of the West building and many attended the nearby Market Street Presbyterian Church. In high school they formed firm bonds and banded together in clubs like the Nine Pins, the Trundle Beds and the True Blues. Most club members would remain in contact throughout their lifetimes. On another occasion, Nine Pins’ members Libbie Dalzell, Mary Boone, Emma Williams, Mabel Thrift, Kate Melhorn, Belle Hughes, Maggie Rumple and Bessie Townsend enjoyed a “lovely trip” to Chicago after charming an official of the Chicago and Atlantic Railroad into providing them free tickets. Bessie Townsend Seymour, who “spent her girlhood on the old Townsend farm at the southwest corner of Baxter and Market streets,” according to The Lima News, recalled the Nine Pins in a speech delivered in 1922. “The Nine Pins were a very jolly set of girls,” Townsend said. “Original and very loyal to each other, they were my old school mates before I went to live in Chicago. 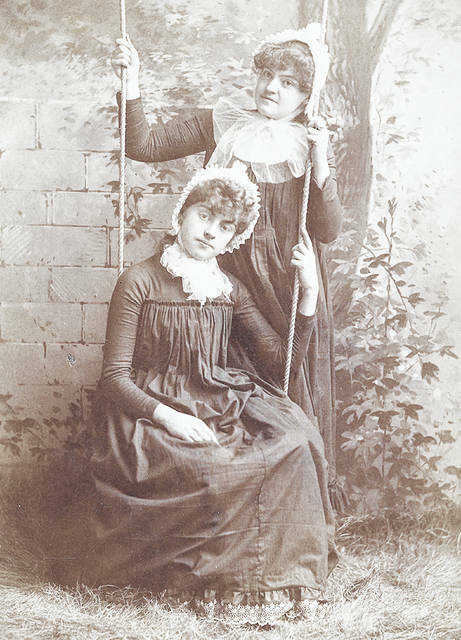 Those composing the club were Mary Boone, Minnie Reichelderfer, Libby Dalzell, Florence Hughes, Emma Williams, Mabel Thrift, Maggie Rumple and Kathy Melhorn.” Townsend, “known to hundreds of Lima residents as ‘Aunt Bessie,” moved to New York State and then Chicago after her marriage. She returned to Lima in 1897 after the death of her husband. But at a Christmas dance, Townsend continued, they met their Waterloo, for the younger set came in. The Nine Pins, with green in their eyes, called the little dears T.B.s — Trundle Beds. They were Stella Moore, Laura Williams, Dora Metzger, May Kibby, Clara Hughes, Hattie Watt, Hattie Ashton, Ethel Cunningham and Cora Holland. As Lima grew — topping 20,000 in population by the beginning of the 20th century — many of the club girls became the backbone of social and civic life. “Libbie” Dalzell, one of the charter members of the Nine Pins, married oil man Alexander T. MacDonell and became a prominent supporter of the Allen County Historical Society. Minnie Reichelderfer married local real estate investor Loren Stamets and became a regular in the society columns of local newspapers. Medora “Mame” Freeman, the daughter of a traveling salesman and one of the True Blues, became a teacher and then Lima’s first librarian. Many married and moved away. Harriett B. “Hattie” Ashton, the daughter of grocer Francis M. Ashton and a member of the Trundle Beds, married railroad man Frederick J. DeGrief and moved to Indiana, while fellow club member Dora Matilda Metzger wed oil man Andrew V. Patterson and they lived primarily in London and Cleveland. They divorced in 1915. Like many of the club members, she was returned to Lima for burial when she died in 1929. Ethel Cunningham, who was raised by her grandmother after her mother died of tuberculosis and her father committed suicide, became an actress and moved to New York City. She died in 1961. Laura B. “Belle” Harrington, a member of the True Blues, was the first of the club girls to die. A “promising student” at the University of Chicago, she died suddenly in January 1900. “She was a daughter of Mr. and Mrs. J.N. Harrington and was the only survivor of a once very prominent family, of father, mother and four children,” the Lima Times-Democrat reported. Minnie Reichelderfer Stamets was the first member of the Nine Pins to die when she passed in 1933. Most of the other girls died in the 1940s and ‘50s. Bertha Hatch, a member of the True Blues, died in 1967. She was the last of the club girls.